The shinyTree package enables Shiny application developers to use the jsTree library in their applications. A simple example to demonstrate the usage of the shinyTree package. 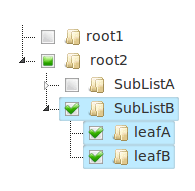 Manage properties of your tree by adding attributes to your list when rendering. Use checkboxes to allow users to more easily manage which nodes are selected. An example demonstrating how to set an input to the value of the currently selected node in the tree. Demonstrates the low-level usage of a shinyTree as an input in which all attributes describing the state of the tree can be read. An example showing the use of the search plugin to allow users to more easily navigate the nodes in your tree. An example demonstrating the use of the drag-and-drop feature which allows the user to reorder the nodes in the tree. An example demonstrating the use of the ability to style nodes using custom classes. An example demonstrating the use of built-in tree themes. An example demonstrating the ability to label and return node identifiers and classes. An example demonstrating the ability to update a tree with a new tree model. This was broken in the original version as the tree was destroyed upon initialization. An example demonstrating node types with custom icons. See the Issues page for information on outstanding issues. Many improvements to expose more jsTree options. Tree can now be correctly updated (see new examples). BREAKING CHANGE: Model the input$list-style lists after the list structure provided to renderTree, meaning that they are now a simple are list with the same st- prefixed attributes. See inst/examples/05-structure. BREAKING CHANGE: removed selected attribute from shinyTree() in favor of get_selected(). See inst/examples/04-selected/.